Israel's army said Thursday it had hit dozens of Iranian military targets around Syria in one of its largest military operations. 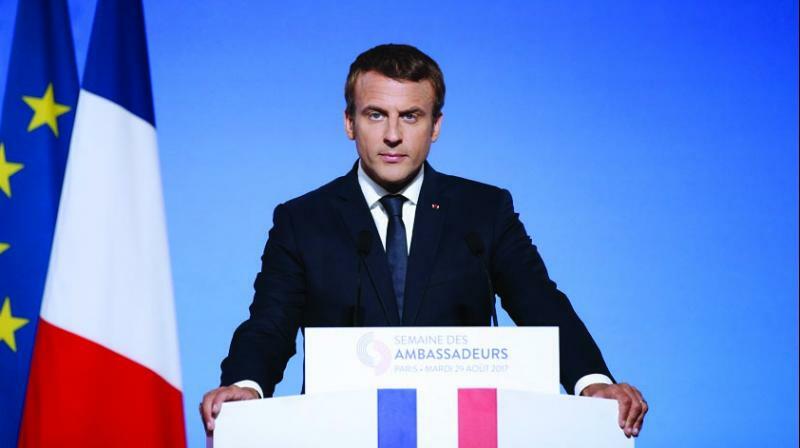 Aachen, Germany: French President Emmanuel Macron called Thursday for "de-escalation" between Israel and Iran after the Israeli army said it struck Iranian targets in Syria following rocket fire it blamed on Tehran. "He calls for a de-escalation", the presidency said in a statement, adding that Macron would discuss the issue with Angela Merkel when he meets with the German chancellor in Aachen, western Germany, later in the day. Israel's army said Thursday it had hit dozens of Iranian military targets around Syria in one of its largest military operations in recent years and its biggest such assault against Iranian targets. Israel carried out the raids after it said around 20 rockets were fired from Syria at its forces in the occupied Golan Heights at around midnight. The incident came after weeks of rising tensions and followed US President Donald Trump's decision to withdraw from a key 2015 Iran nuclear deal on Tuesday, a move Israel had long advocated. Macron said in an interview with the German weekly Der Spiegel published on the weekend that the US withdrawal from the deal could open a "Pandora's Box", adding: "There could be a war."